← South Africa Withdraws Its Ambassador To Israel “effective immediately”. 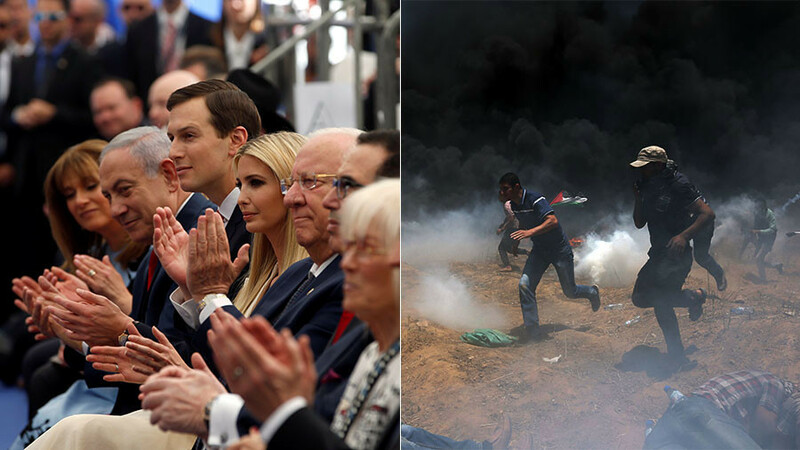 As American officials smiled and clapped at the opening of the new US embassy in Jerusalem, Palestinian protesters were gunned down by Israeli bullets at the Gaza border. 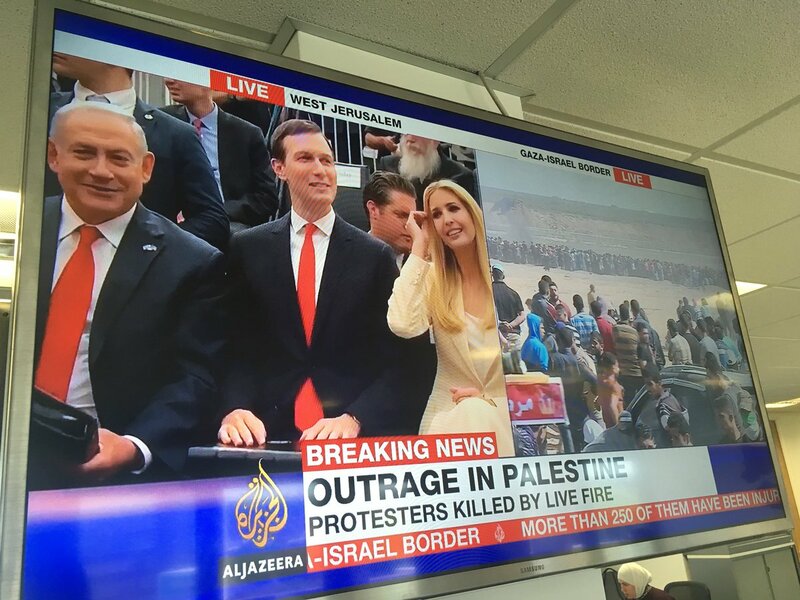 Many users pointed out the images of White House Senior Advisor Jared Kushner and wife Ivanka Trump smiling and laughing at the opening of the embassy with Israeli Prime Minister Benjamin Netanyahu while protesters, among them children, were shot dead in Gaza. Others pointed out the hypocrisy of top US and Israeli officials rubbing shoulders and talking about peace as bullets rained down on protesters a mere 50 miles away. ✔ @eugenegu Jared and Ivanka partying it up in Jerusalem while Israeli forces massacre Palestinians in Gaza is a level of depravity you can only find in the Trump and Netanyahu administrations. ✔ @RanaAyyub Watching Netanyahu’s speech being telecast globally, calling it a glorious and historical day while Gaza witnesses perhaps the worst bloodbath in years. Tyranny has a face. 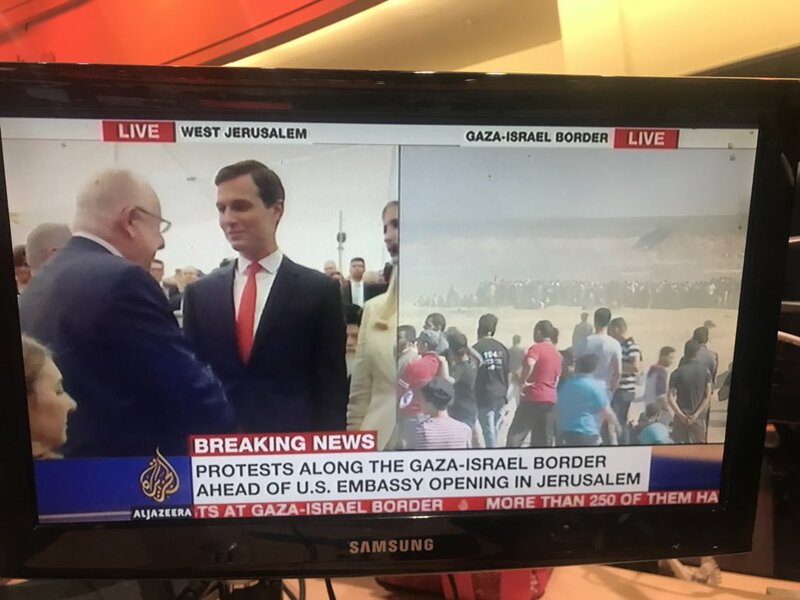 ✔ @Mark_Coughlan There’s Jared Kushner, working hard to bring peace to the Israeli-Palestinian conflict presumably… at the opening of the US Embassy in the divided city of Jerusalem. 37 Palestinians dead today so far from Israeli sniper fire at protests against the embassy and #Gaza blockade. This entry was posted in News and politics and tagged Gaza Bloodbath, Talking peace while bullets, The hypocrisy of US and Israeli, US and Israelis officials smiling. Bookmark the permalink.